Available in a Twin size, the West Indies Headboard features an elegant and refined Caribbean styling with a playful dose of exotic island fun. Create a sophisticated retreat for your guest bedroom or childrens room with the leather wrapped rattan. Capture the essence of tropical island fun for your home with the West Indies Headboard. 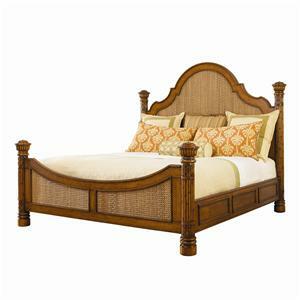 The Island Estate Twin-Size Woven West Indies Headboard by Tommy Bahama Home at Hudson's Furniture in the Tampa, St Petersburg, Orlando, Ormond Beach & Sarasota Florida area. Product availability may vary. Contact us for the most current availability on this product.